If you make chocolate yourself, by hand you have full control over the ingredients and their proportions. In this way you can make a healthy version of this “food of the gods” – tailored exactly to your personal tastes. Raw cacao is particularly high in minerals especially magnesium. This is the mineral that prevents cramping and aids muscle recovery. Coconut butter is good for metabolism, the thyroid and improving bowel flora. Lucuma is a natural sweetener – the more you use the more creamy and less strong and “buzzy” the chocolate is – remember chocolate contains a fair amount of caffeine. You can add nuts, dried fruits, vanilla essence or powder and other delights to your chocolate – I particularly like geranium and orange with cinnamon. Be careful with using essential oils (less is more) – essential oils should not be taken internally by young children, pregnant women or anyone with stomach ulcers. For a party I make a batch of these and then sprinkle with edible glitter… sparkly and delicious. 10 drops of orange or 5 drops of peppermint essential oil – best to choose organic for this purpose and omit if giving to pregnant women (it is likely to be harmless, but best to err on the side of caution). 1. Make a bain marie (take a small saucepan and bring some water to a gentle simmer. Place a pyrex glass bowl over the saucepan so that the bowl does not go in the water. 3. Add the drops of essential oil and a couple of squeezes of biona date syrup or drops of stevia, stir. 4. Add the sifted powders and stir everything together creating a chocolate sauce. Taste the sauce and add more lucuma if liked – or more chocolate powder. The consistency you’re looking for is similar to double cream. 5. 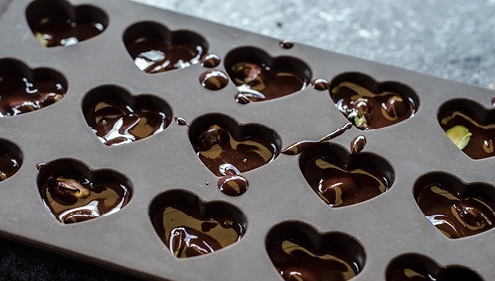 Pour into rubber ice cube moulds or special chocolate moulds (more flexible and easier to use) and refrigerate or freeze to set. I pour into a glass jug and use this to fill the moulds – much easier. 6. Pop the chocolates out the moulds and store in a glass jar in the fridge. Enjoy!